Can the US teams stand up to the powerful Swedes when the four race series begins in January? 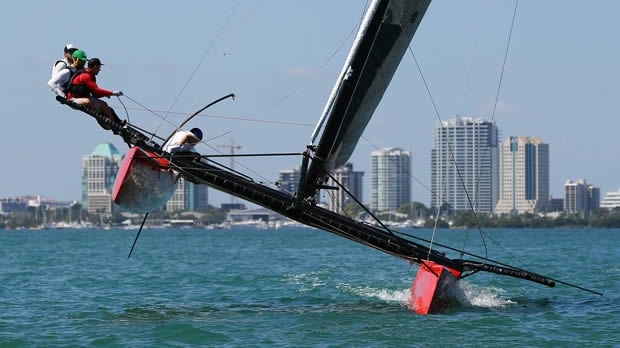 Racing for the high performance M32 catamarans gets underway promptly in 2015 with the first of four M32 Miami Winter Series events running over 8-11 January. At present five teams are confirmed for the first event with a range of competitors including the reigning Match Racing World Champion, two Melges 32 teams, another from Chicago Match Race Centre and a fifth best known for its offshore big boats campaigns. Melges 32 skipper Malcolm Gefter was one of the original owners who, with North Sails President Ken Read, was responsible for introducing the Swedish catamaran to the US, where the first four boats arrived in 2013. Gefter originally bought Lift Off with co-owner Ron O’Hanley, who usually races a Cookson 50 monohull Privateer, winner of the 2013 RORC Caribbean 600. However they enjoyed sailing their twin-hulled speedster so much that they decided to buy a second M32, Escape Velocity, which O’Hanley now campaigns. “Having been a keelboat sailor, switching to a catamaran has been a magnificent, exciting, delightful, informative and sometimes scary experience,” enthuses Gefter, adding that he likes the M32’s high performance, but also its simplicity, due it only using a single sail upwind and two downwind. During the summer in Newport, Rhode Island, five M32s have been regularly competing in Thursday night regattas. The fleet has also been accepted by ‘the establishment’ and has sailed in both the New York Yacht Club Annual Regatta and Newport Race Week. On board Lift Off, Gefter’s crew includes with multihull ace Lars Guck, Max Kramer (son of America’s Cup engineer/designer Dirk), ex-Tornado/Extreme 40 sailor Jonathan Farrar, and Dave Douchett, while O’Hanley’s team on Escape Velocity includes multihull expert Stan Schreyer, plus crew from Privateer. Also making the trip down to Miami from Newport is Micheal Dominguez and his Bronco team. Dominguez became hooked on yacht racing after sailing the Puma VO70. Since then, like Gefter, he has campaigned a Melges 32 before moving to the catamaran. Dominguez is an enthusiast skier and, according to boat captain Tom Loughborough, the M32 provides him with the same adrenalin rush as he gets on the slopes. Coach and team leader for Bronco is top Moth sailor and Melges 32 World Champion Anthony Kotoun, who will sail the highlight of the M32 Miami Winter Series, the Gold Cup on 30th March-3rd April. Otherwise Melges 32 tactician Jeremy Wilmot will be calling the shots, backed up by Loughborough, US Virgin Islands Olympic Laser sailor Sy Thompson and multiple F18 catmaran US National Champion Tripp Burd. Two newbies to the M32s both have backgrounds in the Chicago Match Race Centre (CMRC). Taylor Canfield is one of the most high profile skippers taking part. Despite being just 24, the US Virgin Islander is the reigning Match Racing World Champion. Wilson’s Convexity Racing team has chartered the former Wallén Racing M32 which won this year’s Gold Cup and its original skipper Hans Wallén is returning to help Wilson’s team get to grips with the twin-hulled speedster. Also on board will be leading match racer Matt Cassidy, now with Oracle Team USA. In Miami the M32s are based in Miami Rowing Club, located on Virginia Key, close to Key Biscayne. As usual the boats will be racing the new ‘America’s Cup’ course on Biscayne Bay with reaching starts and finishes and windward-leeward legs between. The US M32s are to be joined by some of the Swedish fleet in the build up to the Gold Cup, but the school remains out over which group will dominate.